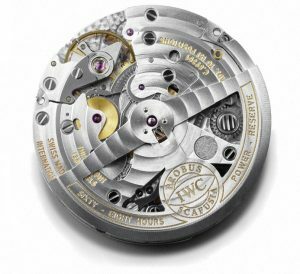 Many have been clear about IWC supply movements and one family of self-made movements. Next, the rest in use will be shown below. Cal. 51XXX and cal. 52XXX are two good models of the 50000-calibre family, featuring seven days’ power reserve. The old version cal. 51XXX has 21,600 VPN. The second generation Cal. 52XXX was introduced in 2015, with a bidirectional Pellaton pawl-winding system. Two barrels provides seven-day power reserve. The indexless balance with a frequency of 4 hertz (28,800 beats per hour). As a model in 51XXX-calibre family, cal. 51111 applies to the Pilot’s 7-Days. Cal. 52110 and cal. 52010 are basic movements in 52XXX-calibre family, and their extended versions apply to the Pilot’s watches and the Portugieser Family. Cal. 52850 is added to the calendar display on the basis of basic movements. Cal. 52610 with calendar display patented by IWC, moon phase and four-digit year display is a representative movement with calendar display. Cal. 52615, an extended version, has South-North moon phase. Cal. 59210 is a basic movement of high-end movement 59000-calibre family, manufacture mechanical movement with manual winding. It provides eight days’ power reserve. The basic versions include cal. 59060, cal. 59230, cal. 59215, cal. 59220 and cal. 59210. The advanced versions are cal. 59360, cal. 59800 and cal. 59900. Cal. 59360 with column wheel has date display, 60-minute timer and power reserve indicator. Cal. 59800 with moon phase. Cal. 59900 with tourbillon is a grand complicated version. 59XXX-calibre family includes different movements with different functions from the basic movements to complicated movements. The Portofino Family collection with cal. 59XXX has been the high-end products. In future, it’s possible the calendar versions will came out. 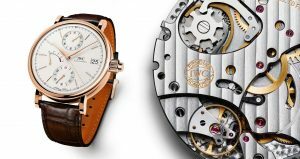 The core technology of IWC focuses on long power, chronograph, perpetual calendar and tourbillon, since most of in-house movements features those above. Now, cal. 89361, one of core in-house chronograph movement, widely applies to the main collection. An absolute widely-used chronograph movement in all IWC movements. With the functions are added to the basic movement, many complicated movements came out. Cal. 89900 with tourbillon chronograph. Cal. 89630 with four-digit year calendar chronograph. Cal. 89801 with month-day-date display chronograph. Cal. 89760, a GMT chronograph movement. Cal. 89365, a new model based on cal. 89361, is an automatic winding chronograph movement. These in-house movements proves researchment and development capabilities of IWC. Cal. 98XXX, manufacture mechanical movement with manual winding. Its basic model is cal. 98300, a revised version of cal. 98295. 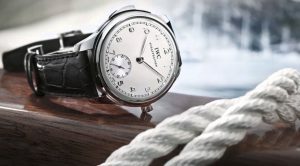 It’s also called the “Jones Arrow” movement, which applies to IWC Vintage watches in order to honor Florentine Aristo Jones, the U.S. founder of IWC. There are mainly two models-cal. 98900 with tourbillon and cal. 98950 with minute repeater system in 98XXX-calibre family. They’re grand complicated movements. As one of the most complicated movements in IWC, cal. 94900 has both constant-force tourbillon and astronomical display. IWC Portugieser Sidérale Scafusia IW5041-01 is equipped with cal. 94900. IWC has far more movements than those. Due to the replacements of old and new movements, the old models are used rarely, for example, 80000-calibre family. 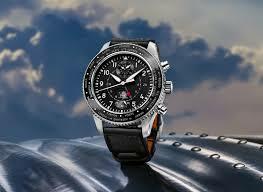 Judging from in-house movements, IWC shows its capability on modifying, developing, processing movements. Cal 69370 and cal. 69375 fill in the gaps of self-made entry level chronograph movements. IWC will release entry level automatic movements with hour, minute and small second hands. Hence, IWC in-house movements will form a strong team.